This week's word is food-related. Food and language - a great combination ! One day, while watching a tv cooking show about légumes oubliés, or "forgotten vegetables," I saw these little tubers and learned that they are called crosnes. They originated in China or Japan and were introduced to France in the 19th century. 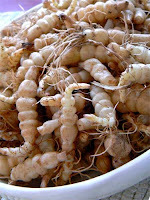 They are the tubers of a plant in the mint family and are called crosnes because that is the name of the town where they were first cultivated in France. Crosnes are a bit crunchy (but tender when cooked) and taste subtly of artichoke. They can also be eaten raw in salads. I decided that I wanted to taste them, so I started looking for them this season in the markets to no avail. It seemed as though there were no crosnes this year. But just last Saturday Ken found some at our local farmers' market in Saint-Aignan and he bought some. Our house guest, Peter Hertzmann, cooked them by par-boiling them and then sautéing them in butter. He served them seasoned with salt and pepper alongside brussels sprouts and Aveyron sausages. They were delicious ! This is one tool that every kitchen needs. In my humble opinion. Food mills are ubiquitous in France - or at least I get that impression. 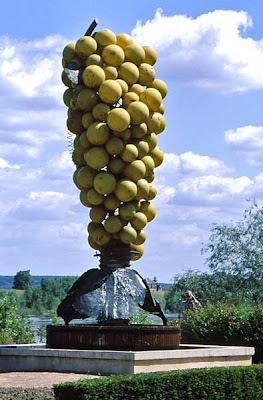 Here, they're called moulins à légumes. I think this one is our second one. We had and older one made from molded plastic, but it got stained over time and didn't fit with the decor of our stainless kitchen in San Francisco, so we replaced it with this shiny all metal model. The business end of the food mill with the medium blade installed. I never knew how much I needed a food mill until I had one. It makes great purées. It's takes a lot of work out of applesauce. Straining home-made tomato sauce was never easier. The principle is that you don't have to remove skins, pits, stems, or whatever - the food mill does it for you after your veggies/fruits have been cooked ! And it builds up good arm muscles. It comes with three blades : course, medium, fine. Being all metal, there are no stains and it goes through the dishwasher without worry. If you don't have one, go get one. They're not expensive at all. 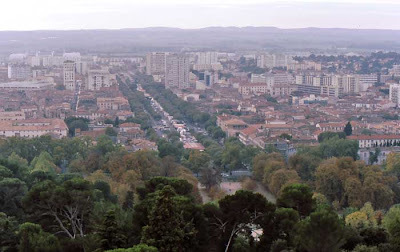 While in Nîmes, Ken and I ventured up to the highest point in the city, le mont Cavalier, to the historic Tour Magne. This tower dates from pre-roman times and was eventually incorporated into the defensive wall around Nîmes in the first century before our era. A view of the amphitheater, with its appended dome, from the Tour Magne. I believe that tree-lined street is the Blvd. Victor Hugo. 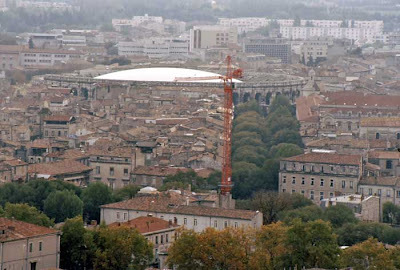 The transition between the old roman center and the medieval city and the more modern neighborhoods outside the core of Nîmes. 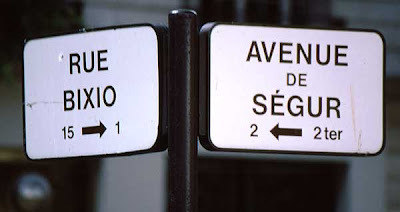 The Avenue Jean Jaures cuts a straight path just outside the western flank of the old city. It's home to one of the city's outdoor markets. If I remember correctly, our first stop after having left Grenoble was Nîmes. This is an old Roman town, complete with Roman amphitheater and temple. My memory is that it's a cool place. When we were there in 1989, a dome was being installed over the center of the amphitheater. I think that has since been removed (thankfully). The Roman amphitheater at Nîmes. 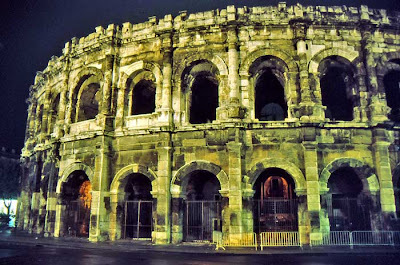 The arena at Nîmes was completed, along with its sister arena in Arles, in the early second century of our era. Through the middle ages the arena was transformed into a fortress and eventually became filled with streets and buildings. It wasn't until the early 19th century that the buildings were demolished and restoration began. We ventured out at night and I used my tripod to take photos of the monuments all lit up. 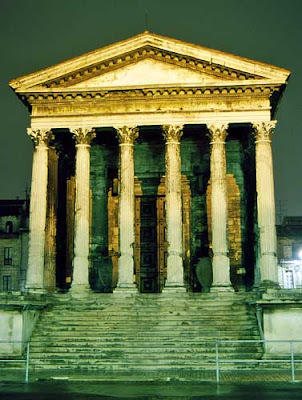 The Maison Carrée (above), a roman temple that survives intact since its construction in the first century, B.C., is impressive in its symmetry and simplicity, and beautiful when lit at night. We stayed in a relatively inexpensive hotel near the center of town. I remember that, when we were signing in, the desk clerk asked Ken what his nationality was. When he responded "American," she literally took two steps back and gasped. She was amazed at how well he spoke French and told him that she could believe he might be Belgian, but not American. Yours truly, striking a pose in Nîmes. There are about 133,000 Nîmois today. I flew non-stop from San Francisco to Paris on UTA French Airlines - now defunct. That's my boarding pass from the flight on the left (I save everything). The flight originated in Tahiti and its only stop was in SF. The plane was full of French vacationers on their way home from their tropical holidays. This was back in the days when you could still smoke on planes. And nobody told you to keep your seat belt loosely fastened while seated, in case of turbulence. 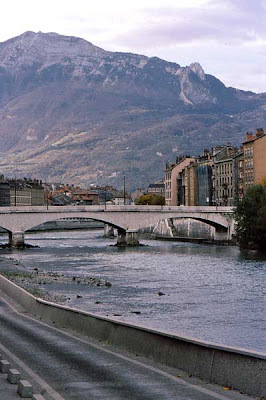 Grenoble on the banks of the Isère. The entire trip was a huge party. Passengers formed small groups in the cabins, little parties popped up here and there. People gathered in the aisles, but no one seemed to mind. They smoked, passed food around, drank liberally, and laughed for nearly the entire eleven hour flight between San Francisco and Paris. It was a very different scene from the strict, regimented, safety and security conscious flights we take today. The téléphérique carries you up to an overlook. The little spherical cabins were quite small. I arrived in Paris and made my way to the Gare de Lyon for the TGV trip down to Grenoble. Of course, in 1989, the TGV high speed line only went to Lyon. From there we were on slow tracks to Grenoble. Ken picked me up at the station and we spent the afternoon and night in town. 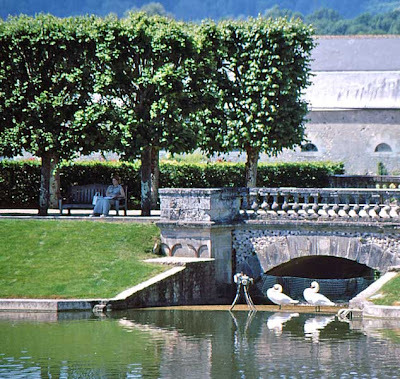 The Grenoblois live in the Isère river valley, in a mountainous region on the edge of the French Alps. It was October, and the leaves had begun to change. I remember having dinner in a pizzeria along the quai of the Isère. 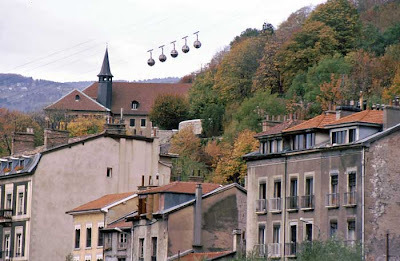 We also rode the téléphérique up to a lookout on a mountain beside the river. The next day we got in the car and started driving. The road trip was on. Well, that's it for Paris this time. There are lots more Paris pix, of course, but they'll have to wait until later. I've now started scanning a set of slides from 1989. First, a little background : Ken and I met in Paris in 1981. By 1983 we had rented our first apartment together in Washington, DC. Later, in 1986, we moved to San Francisco. It wasn't until 1988 that we went back to France for the first time since leaving in 1982. That year, we stayed in Paris revisiting old haunts. 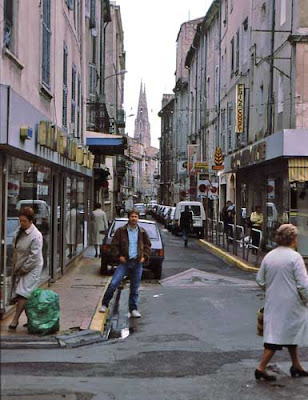 The following year, 1989, we took our second trip to France and did a driving tour around the southwest. I had just started graduate school at Berkeley. It was the year I turned 30. The trip began in Grenoble. Ken was there for a conference, and I joined him at the end. We rented a car and started driving. We had a loose plan, but not much of one. The only reservations we had were at the hotel in Paris the night before our flight home. 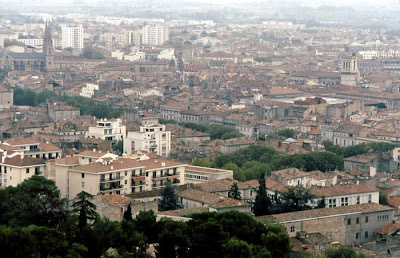 Our drive took us to Nîmes, Arles, Aigues-Mortes, Sète, Carcassonne, Castelnaudary, Toulouse, Cahors, Bergerac, Bordeaux, Royan, Cognac, Poitiers, Chambord, and Chartres before we headed to Paris for the flight back to SF. 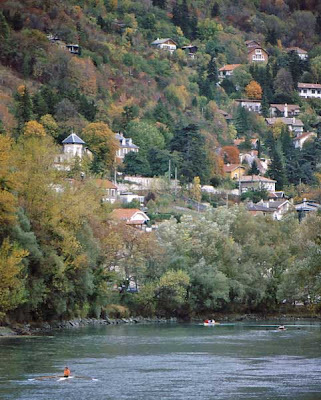 During that trip, we drove through a small, unremarkable town called Saint-Aignan on the Cher River. We had no idea, of course, that fourteen years later we'd actually buy a house and move there. The 1989 trip was the first of many French "road trips" Ken and I have taken together over the years. I was just getting into photography then. So now, I'm digitizing the slides and will post some of them over the next few weeks. Stay tuned ! Lunch with what, you ask ? I think I've talked about topinambours before, but I'm not sure. In any case, these are great little tubers whose taste is reminiscent of artichoke. 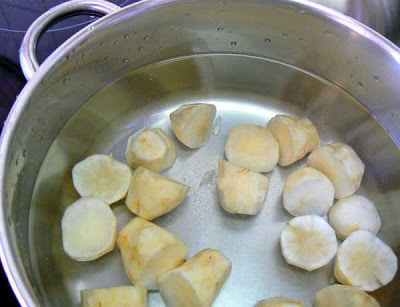 Topinambours, or Jerusalem artichokes, before they are peeled. 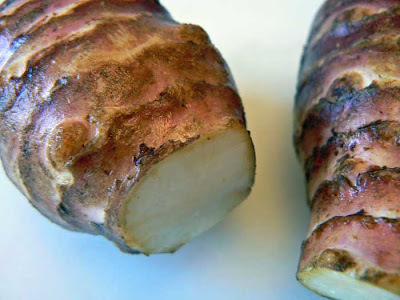 In English, topinambours are called Jerusalem artichokes or sunchokes. 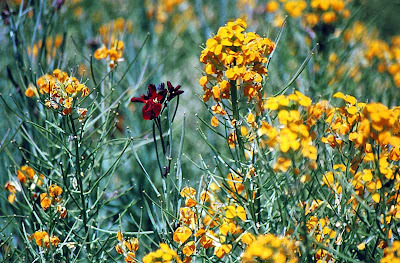 They are the tuber of a particular kind of sunflower native to North America. I read that they are called topinambours because at the time they became popular in Paris, members of a tribe of natives from Brazil called the Topinamboux had become a great curiosity. 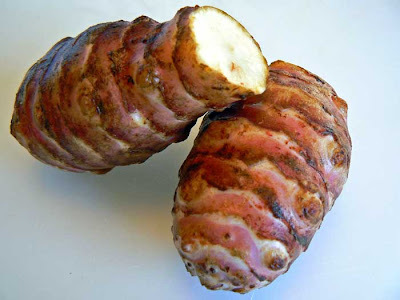 Somehow the tuber was associated with the visiting South Americans, and the name stuck. A close-up of Jerusalem artichokes. There are theories, too, for why they're called Jerusalem artichokes, one of which goes like this : since it was Samuel Champlain who brought them back to France from Canada, and a French word for sunflower is girasole (one who turns toward the sun - although the current word for sunflower in French is tournesol, same idea), the name got corrupted to Jerusalem. Who knows ? As for sunchoke, it's just a marketing term that was made up in the 1960s. Peeled and sliced topinambours coming to the boil. Whatever the truth, these are delicious. They're available from fall through winter in our region and we try to eat them a few times a season. The only problem with them is that they can cause gastric distress in many people. You know, that's the polite term for gas. But they taste good enough to be worth the, er, discomfort. The purée is ready ! So I cleaned up our latest bunch of topinambours, boiled them until tender, and put them through the food mill along with some potatoes. Then I added butter, cream, salt and pepper and, voilà. 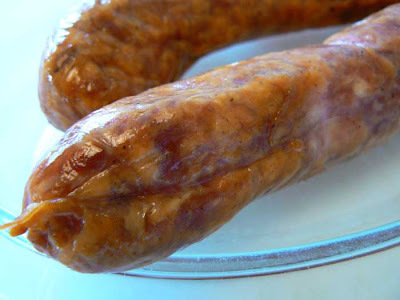 Saucisses fumées from the market in Saint-Aignan. 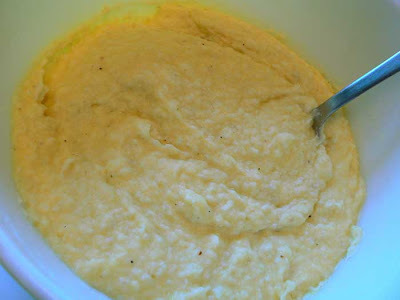 We ate the purée along side a couple of smoked sausages from the charcutière at our local outdoor market. Delicious. One of our neighbors has three cats. We see them all the time out and about the 'hood, hunting. Since our dog died last year, they actually come into our yard a lot - which is a good thing as they help keep mice and moles away. The biggest of the three is a gray tom named Filou. You can see him here. Our friends in Normandy have a cat named Filou, too; you can see him here. There's also a product being advertised pretty heavily on tv right now called Petits Filous. Made by Yoplait, they are a blend of fromage frais and lowfat milk, flavored with fruit and sugar. Now with 10% more fruit ! Now with 10% less sugar ! I've never tasted one. So what does a cat and a yogurt-like product have in common ? The word's basic meaning is rascal or scoundrel. It's often used to describe kids who are cleverly precocious; cats, too, apparently. Petits filous, therefore, are little rascals. The juicer. No, not the plug-in kind, not the attachment to your Kitchen Aid. The good old-fashioned glass juicer. We have two that we found in second-hand stores and they both get used a lot. We have a third that is a wooden hand-held juicer. 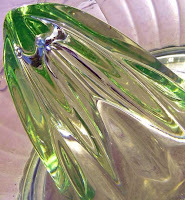 The late Jeff Smith, aka the Frugal Gourmet, called it a lemon reamer. Rather graphic but accurate. When he used one on his show back in the 80s, we decided it would be handy and ran out and got one. Its only drawback is that the pits go right into the dish you're juicing over. The glass models have a built-in bowl to catch the juice, then you can pour it through a strainer. 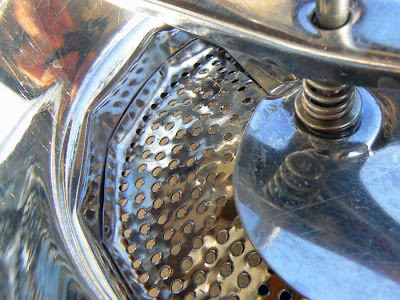 I've see glass juicers on French cooking shows that actually have little spikes around the base of the "hump" that trap the seeds when the juice flows into the bowl. Chouette ! 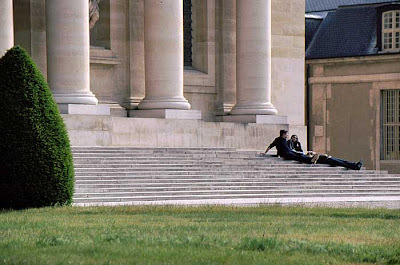 The Hôtel des Invalides is an impressive place to walk around, let alone enter. Here are a few exterior shots of the Eglise du Dôme. It's only a small part of the entire complex, but the most recognizable. 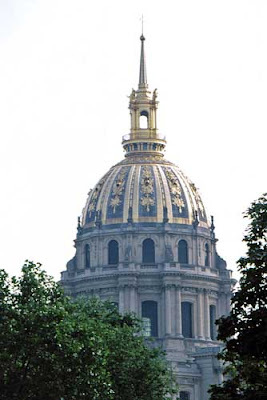 Under the dome, which was re-guilded for the 1989 bicentennial of the French Revolution, is the tomb of Napoléon Bonaparte. Normally, in good weather, the steps of the Eglise du Dôme are crowded with people entering to see the crypt and tomb. Here though (above), a few folks relax in relative calm. These huge granite things looked like chess pieces to me. I'm not really sure what they are. Could they be decorative elements from the top of a roof or dome that have been restored and put here on display ? Or maybe they're just supposed to be there, just as they are ? p.s. I posted smaller versions of these photos about a year ago as part of the walking tour series. Sorry for the repetition. 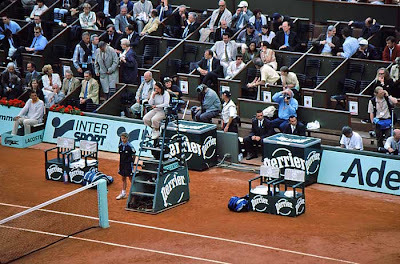 As I mentioned yesterday, we attended the women's semi-finals at the French Open in 2001. The weather was great during the matches, but I remember that just after the second match ended, the bottom dropped out and we had a huge thunderstorm. Great timing ! 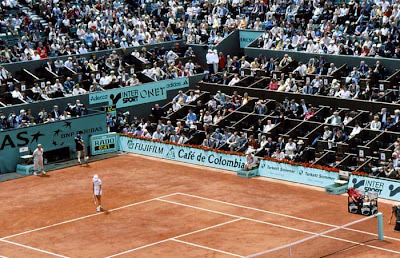 Tennis gets underway in Court Central at the 2001 French Open, Roland Garros. These are not the cheap seats. The first semi was Jennifer Capriati vs. Martina Hingis. The second was all-Belge : Justine Henin vs. Kim Clijsters. Capriati went on to defeat Clijsters for the championship. Henin in the back court. 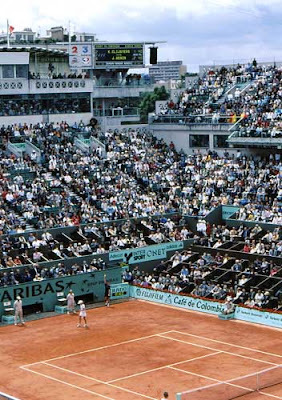 The first French Open we attended was back in 1997, Martina Hingis' first final in that tournament. She lost. That was also the year that Gustavo Kuerten won his first French title. We attended both of those matches. Justine Henin prepares to serve to Kim Clijsters. Our last Open was last year, when we sat in a rainy Court #1 for second round matches. Although wet and dreary and full of delays, it was still loads of fun. The French Open, or Roland Garros as it's called, is the only one of the four Grand Slam tournaments that is played on clay, or terre battue. It's also the only one of the four that is not held in an anglophone country, and so far the French have been good about not calling scores in English. I hope that doesn't change. Out of the Loire Valley and into Paris. Same trip : 2001. We stayed in a hotel in the 7th on the Avenue Duquesne. We were only in Paris a few days this time on our way back to California. A view of the tower from near the Invalides. The purpose of the Paris stop was to go the French Open at Roland Garros, where we saw the two women's semi-final matches. 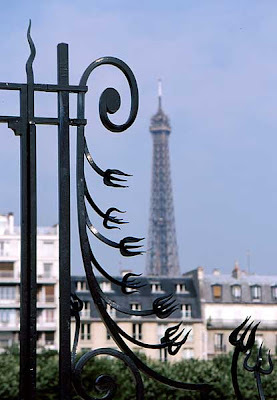 But I could not resist taking pictures of my favorite Paris icon. Wrought iron gates frame the view. 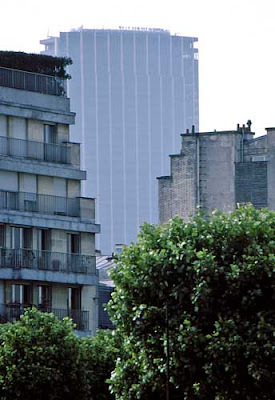 I'm also one of the only people I know who actually likes the Tour Montparnasse. To me, it's like a giant exclamation point in the city. It's a great landmark for getting your bearings, and the views from the top are incredible (I'll post some sometime soon, once I get them scanned). 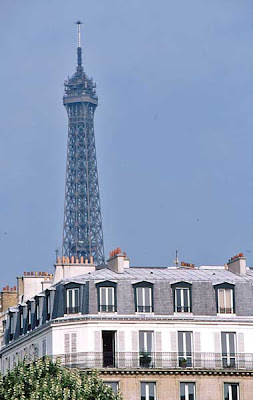 La Tour Montparnasse. Those little black dots on top are actually people on the outdoor observation deck - 56 floors up. Can you stand it or what ? Like I said before, I'm enjoying seeing all these old slides again, so I'm posting some of them here. Wine merchants hawk their wares along the main road in Vouvray. If you haven't been following along, Vouvray is a wine town on the Loire River just east of Tours. The single varietal grown in Vouvray is chenin blanc, from which all manner of wines are made from dry to sweet, still and sparkling. 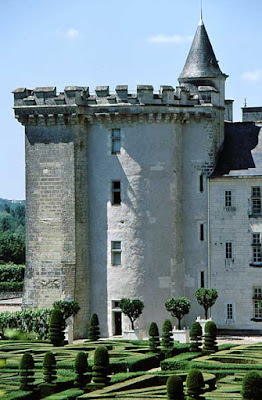 Ken and I spent two vacations in Vouvray in 2000 and in 2001. This photo (above) is a window in the house we rented both times. We liked the area so much that when we decided to buy a house in France, we found one not too far away. 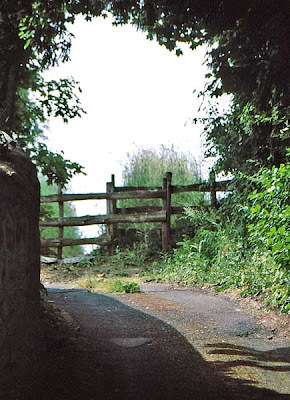 A country lane near the vacation rental in Vouvray. The vacation house we rented has since been sold and converted to a private residence. 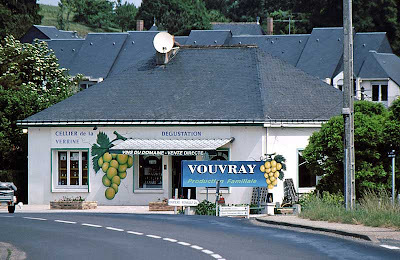 We go back to Vouvray every now and again to buy wine from a local producer in la Vallée Coquette. What more is there to say ? Except this : we do recycle our wine bottles. Mostly, we re-use them since we by wine in bulk from the vintners and bottle and cork it ourselves at home. Then we rinse out the bottles and re-use them. When we buy bottled wine, the empty bottles go to the recycle center. 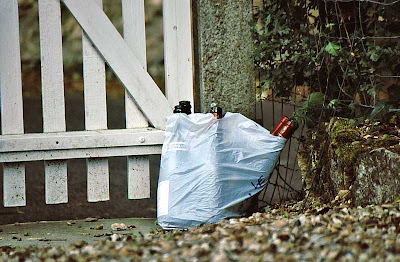 This photo was taken in Vouvray and I think we had put the bottles out next to the gate prior to taking them to the recycle place. They are on the inside of the gate here, not out on the street. Now, this one's easy. Literally. Fastoche is a familiar version of the word facile, which means "easy." That's all there is to it. It's that simple. Every kitchen, I would wager, has a way to measure volume. The most common way to do it, I suspect, is the measuring cup, graduated with volume measures. 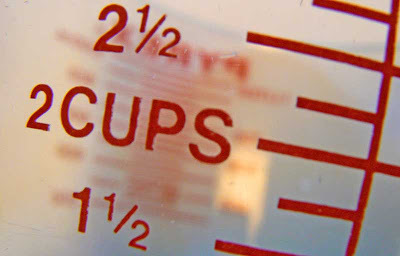 Some are emblazoned with the American system of cups and ounces, others in the more universal metric system, and some come with both measuring systems. I'm sure there are cooks with none of these tools, who have rather a good sense of volume and a good eye. I'm not one of them. The cups are made of glass, plastic, or metal. In fact, we have all three materials in our collection of measuring cups. The ones used most often chez nous are of the glass variety. We have several of the standard Pyrex measures ranging in size from one cup up to four (a quart). We also have a couple other glass cups that we've picked up in second-hand shops because we liked the way they look. One of them, a favorite, recently broke. We have three sets of handled measures, too. These are the familiar individual nested cups (1/4, 1/3, 1/2, 1 cup), two sets made of stainless steel and another set made of plastic. We also have other graduated measures that do double duty as gravy separators, food processors, and hand-mixer bowls. The town of Montlouis-sur-Loire is just across the Loire river from Vouvray. 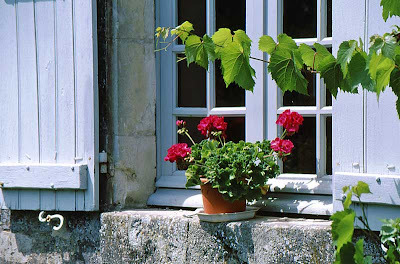 It is also a wine town and produces wonderful Touraine whites with its only varietal, the chenin blanc grape. 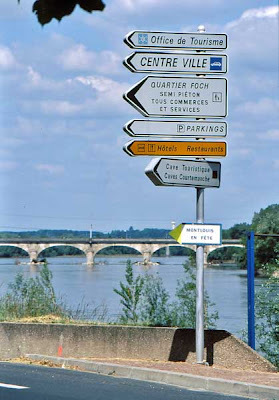 An intersection in Montlouis on the banks of the Loire river. There are just over 10,000 Montlouisiens. The town rises up on bluffs above the river, and there are wine caves carved into the stone below. 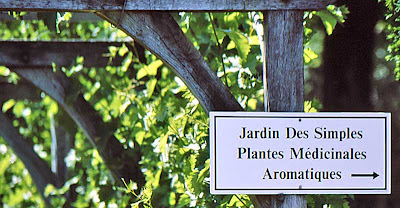 In Montlouis, they are proud of the chenin blanc grape. We visited one of the more generic of these caves, on more than one occasion, and thoroughly enjoyed it ! 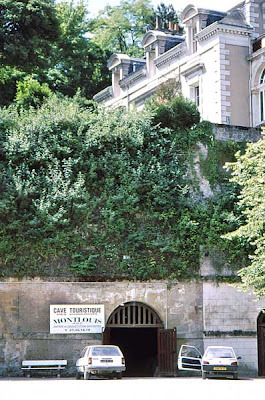 A wine cave in Montlouis with the main house on the cliff above. Tasting and buying done here ! 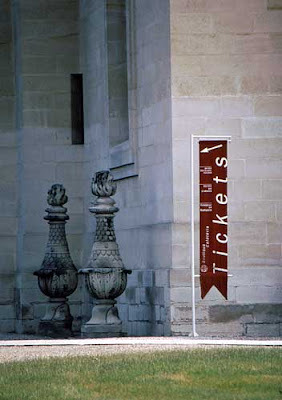 Just a few last photos from the gardens and château at Villandry before moving on. A sign points the way. Cheryl and Ken in one of the allées. Part of the Château de Villandry. Remember that these pictures were taken back in June 2001. The weather was hot, very unlike the weather we're having right now. We're having very blustery weather. It was quite windy overnight, and Météo France is predicting high winds (gusts around 85-90 kph) for Monday. Kind of repetitive, but what the hey. Swans can be very photogenic. 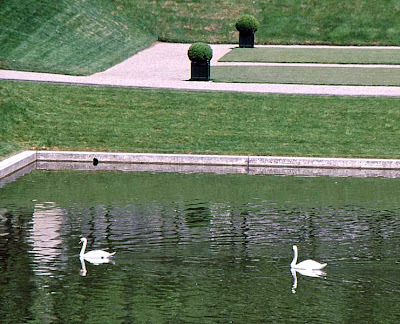 One of my favorite photos (of mine) is a shot of swans at Vaux-le-Vicomte, a château that's well worth visiting outside of Paris. 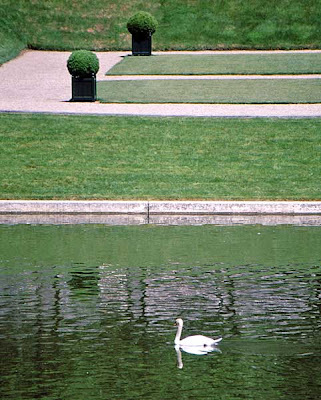 In that picture, the swans are facing each other making a heart shape with their heads and necks. Not very original, but I like it. Just to the west of Tours, on the left bank of the Cher river just before it joins the Loire, sits the Château de Villandry. 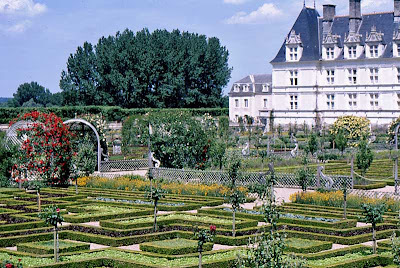 Built in 1536 by a member of King François I's court, this renaissance castle is more known for its expansive gardens than for the castle itself. 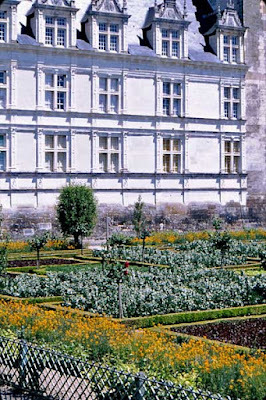 A portion of the château seen from the kitchen garden parterres. 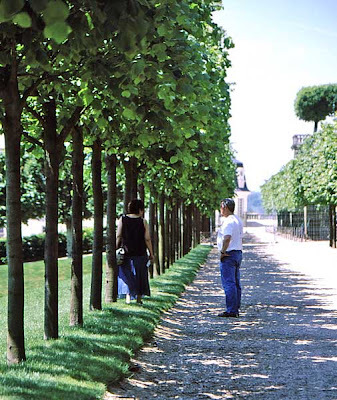 I visited the castle gardens in summer of 2001, with Ken and our friend Cheryl. 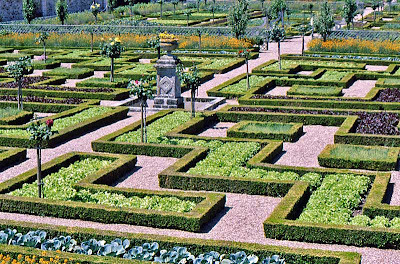 The theme of the lower garden terrace (closest to the castle) is le potager, or kitchen garden, and the parterres were filled with all manner of edible plants, vegetables, and herbs. Lettuces grow inside the box hedges in the kitchen garden. Tall roses give some height to the otherwise low plantings. 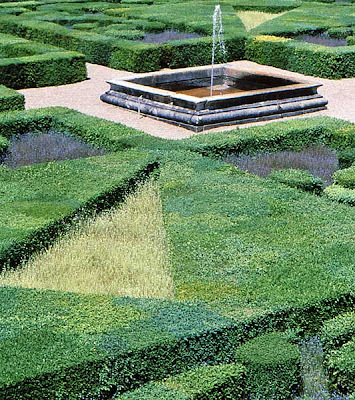 There are two other terrace gardens that rise up the slight incline behind the castle, and they include a water garden, a flower garden, sculpted plants, and a labyrinth hedge. My descriptions cannot do justice to them, nor can my pictures, but here they are nonetheless. Herbs and grasses grow in between the shaped hedges in this section of the garden. I would love to go back in spring and fall to see how the garden changes with the seasons, not to mention the interior of the castle itself. Maybe that's something to do this year ? Tuesday's lunch was an impromptu affair. We have a freezer full of stuff from our summer garden that must be used in the coming months. Among our stash are freezer bags filled with grated summer squash and quite a few 2-cup portions of tomato sauce. 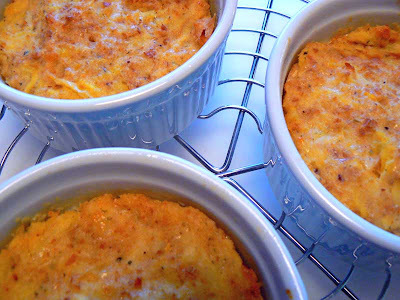 Ken found a recipe in the Joy of Cooking for timbales, little eggy custards made with vegetables. So I thawed out some squash and sautéed it with grated shallot, and tossed a portion of our frozen tomato sauce in the microwave to thaw. 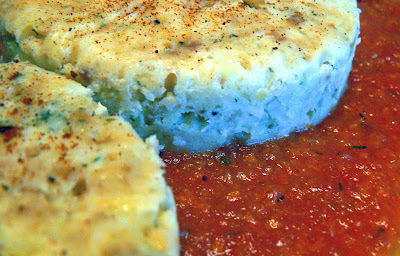 The cooked squash timbales cooling on a rack. Then I mixed the cooked squash with 2 eggs, some crème fraiche, some grated leftover cheese (chaussée aux moines), fresh breadcrumbs (that we make with leftover baguettes and keep in the freezer), seasoned it with salt and pepper, added a couple dashes of hot pepper sauce, and sprinkled in some dried cerfeuil, or chervil. 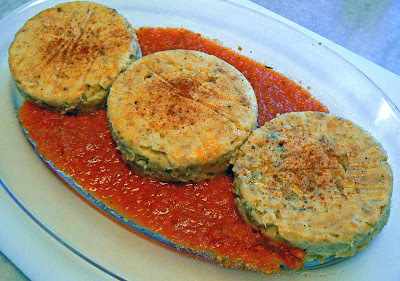 The timbales are served, surrounded with tomato sauce and sprinkled with paprika. This mixture went into buttered ramekins (I don't have real timbale molds) and into a water bath in a 160ºC oven for about half an hour. When they came out, they cooled for 10 minutes before I unmolded them and surrounded them with sauce. They were delicious, a little taste of summer, and we ate all three. Photo Du Jour : Where Now ?